Tasmania-based, we are leaders in guided bushwalking tours and transportation shuttle services. 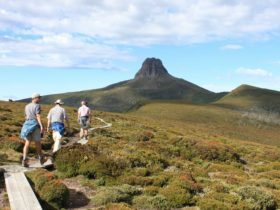 Our guided walks explore Tasmania’s national parks and World Heritage wilderness areas and cater to a range of experience levels. You can join our four day Maria Island Guided Walk, five day Frenchman’s Cap walk, six day Overland Track walk, six day Walls of Jerusalem walk, six day Lake Oberon walk, nine day South Coast Track, 6 Day Moonlight Ridge walk, 3 Day Mt Field and 8 Day Western Arthurs Walk. 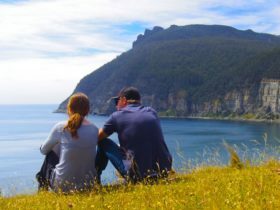 The guided walking tours cover a diverse range of Tasmanian landscapes, from remote coasts and towering mountains to ancient forests and open button grass plains and offshore islands. Tasmanian Hikes treks are guided by experienced trip leaders. All tours are small group departures to maximise your adventure experience and minimise environmental impact. All equipment, food, track accommodation and transport from Hobart is included, so all you will need to bring is your personal trekking gear and of course, your camera. This National Park is part of the Tasmanian World Heritage area. What makes this walk renowned is its “wilderness” landscape. What is mostly significant about the landscape is its glaciation, amazing beauty, unique natural and cultural values. Your guided walk starts at Cradle Valley and snakes its way through rainforests and past craggy mountain peaks and alpine moors to Lake St Clair. Your walk is over five nights and six days and this tour is camping in twin share four-season tents on specially constructed timber platforms. Our itineraries are well researched thus giving you time to do many side trips such as climbing Tasmania’s highest Peak – Mt Ossa and visiting the many waterfalls en-route. 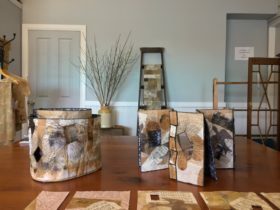 We strive to make your walk as comfortable as we can. You will only need to carry your own sleeping bag, sleeping mat, personal gear, a share of your tent accommodation and your own personal rations (no group food). Your pack should not weigh more than 13.5 kilograms. The Walls of Jerusalem National Park in Tasmania was proclaimed in 1981 and it is an alpine wilderness made up of mountain tarns, lakes and dominant peaks. This part of Tasmania is known as the Central Plateau. It has been formed by the process of uplifting and glaciation. You’ll be amazed by the grandeur of the dolerite peaks, the serene mountain tarns and the unique alpine vegetation that the park offers. Wildlife commonly seen includes the Bennett’s Wallaby, pademelon, wombat, the possum, spotted and eastern quolls and the Tasmanian Devil. Our six day trek departs in the warmer summer months of November through to April but within these months the weather can still be changeable. The walking requires a medium level of fitness and is fairly easy. You are required to carry a pack of around 15 – 16kg. Our Walls of Jerusalem trekking tour is an absolutely amazing visual and cultural experience. Please read our itinerary on our website to get an overview of our tour. Your nine day, 85 kilometre journey on the South Coast Track begins with a light aircraft flight from Hobart to the Melaleuca airstrip in the Southwest National Park. You then trek east, along an ancient route used for thousands of years by local Aboriginal people. On your journey you will walk along wild beaches and scale dramatic peaks; trek through temperate rainforest and cross pristine rivers and streams. You’ll see evidence of ancient Aboriginal culture and experience a breathtaking diversity of plant, animal and bird life. You will need a good level of fitness for this challenging trek, covering up to 15 kilometres each day carrying a full pack. You’ll be rewarded with spectacular landscape, stunning campsites and the satisfaction of completing this great wilderness walk. Please refer to our website for a detailed itinerary. On this trek you will spend five unforgettable days trekking through the Franklin – Gordon Wild Rivers National Park to your destination – the white quartzite dome of Frenchman’s Cap (1443 metres). Beginning your journey at the world famous Franklin River, you will walk across button grass plains, through dense rainforest and among wild mountains. You’ll camp at stunning Lake Tahune, nestled below the mountain’s towering 450 metre south-east face before ascending to the summit of Frenchman’s Cap itself. In fine weather, you will experience spectacular views of the surrounding mountains and forests of Tasmania’s south west wilderness before retracing your steps back to the Franklin River and your coach journey home. See our website for a detailed itinerary. This tour best introduces you to the range without doing the full ten day traverse or negotiating the rougher and more exposed sections beyond Lake Oberon. This tour is best suited for reasonably fit people and you will be required to carry a share of the food and equipment. This walk is over six days and returns back along the same route as our approach.